Darwin's theory of evolution had a revolutionary effect on the study of biology, but it didn't just appear out of the blue. For a long time beforehand people had been arguing about the relationships between different species of living things, and whether similarities implied a common descent. Keith Thomson's book, entitled Before Darwin:Reconciling God and Nature in the USA and The Watch on the Heath:Science and Religion before Darwin in the UK, takes a look at some of the people involved in these arguments. It was in the 17th century that science really began to take on its modern form. It became established that explanations of why things were the way they were needed to have a scientific form, and the work of scientists such as Robert Hooke and Robert Boyle in areas such as microscopy showed what progress could be made in this direction. There's a chapter in the book on the work of their contemporary John Ray and how his attempts to understand the patterns he saw in nature were an important step in the classification of living things. Thomson goes on to look at how Robert Plot struggled to make sense of fossils - were they really the remains of dead animals, or did they just grow in the rocks. Why shouldn't whatever priniciple it was that gave animals their form also be able to work on inanimate matter? Thomson also describes the books which were being written on the subject, such as The Sacred Theory of the Earth by Thomas Burnet. One thing I would note about the book is that it isn't really structured to lead up to the work of Darwin, as one might expect. Rather, it is more centred around the work of William Paley. Hence the UK title seems more appropriate than the US one, since it was Paley who used the analogy of a watch in his book Natural Theology to argue that living things must have had a designer. Thomson looks at which works would have influenced Paley, and at his arguments with his contemporaries such as Erasmus Darwin. Thomson does go on to look at how the arguments continued after Paley's work - in the work of Charles Lyell and William Buckland for example - but this tends to be in the context of how they were influenced by Paley. Indeed Thomson stresses that Charles Darwin was greatly influenced by Paley's work. It's all about religion, isn't it? One thing I've come to believe from reading works by authors such as Allan Chapman is that the science vs religion conflict is overstated. With the current resurgence of Creationism/Intelligent Design (No one believes those IDers who claim they don't have a religious agenda) there is a tendency to assume all arguments were religious in nature. Although the works Thomson describes show that there were all sorts of reasons for arguing for and against evolution, I felt that he could have done more to show that the arguments weren't as simplistic as is sometimes claimed. Also, again, the US title is misleading, since what Thomson shows is that most of the attempts at reconciliation of the Biblical account of Creation with scientific findings eventually faced insuperable problems What he does do well is to get to the root of some of the arguments against evolution. The eye for instance, which creationists often use as an example of something which could not have evolved. The strange thing is that they often seem to present this as if it has recently been thought of - certainly you seldom get to hear about existing rebuttals of this argument. Well, it isn't new - Thompson points out that it was put forward by many writers in the 18th century. It worried Darwin in the 1840's but by 1859 he was happy that this argument had been refuted. And apparently contemporaries of Paley thought the watch argument was rather 'old hat' - a similar argument can be found in the works of Cicero. 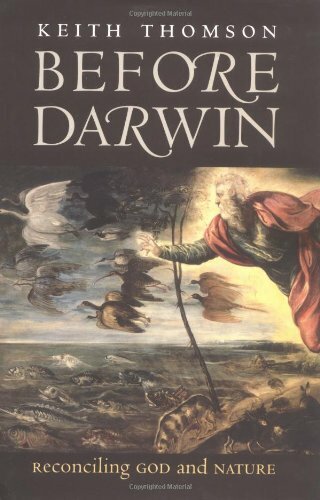 Another book I've read on a similar topic is Forerunners of Darwin. This a collection of essays edited by Bentley Glass, Owsei Temkin and William L. Strauss Jr. Following a substantial introduction, it has two main parts, dealing with what was written about evolution in the 18th and 19th centuries respectively. The 18thcentury part has essays on some of the main writers of this period, such as Maupertuis, Diderot, Linnaeus and Herder. The 19thcentury part deals less with individual writers, and more with considerations of some of the philososophical ideas of evolution and the objections to them, including plenty of discussion of the idea that 'Ontogeny recapitulates phylogeny'. The book was published nearly 50 years ago and some of the essays were written nearly a century ago, so it won't give you the latest thoughts on evolution, and it isn't particularly easy to read. But as a historical work it does have the benefit of being closer to the arguments which are written about. It also shows that objections to Darwinism weren't just on religious principles. It might suit those looking for more detailed examination of the arguments, or those interested in an historiographical view of the subject . Keith Thompson's book presents a useful introduction to the discussions about evolution which were taking place before Darwin came on the scene. It looks into the work of a large number of writers on the subject, but in particular William Paley. (It also has drawings of each of the writers considered). For those wanting to learn more about part of the subject there is a substantial bibliography. The book is easy to read and requires no prior knowledge of the subject, and so would suit anyone wanting to get a better view of the origins of the biological sciences and the arguments which took place for and against evolution.